You. Me. Ride This Crazy Train - Adventures and Observations on The GO: New game! WILL IT FIT? Let me tell you something, some y'all just too nice. Why? You're making excuses for people who need lines to park. That's a no from me. Winter proves challenging to many drivers knocked stupid by snow and then have no idea how to park a car without the help of yellow lines. 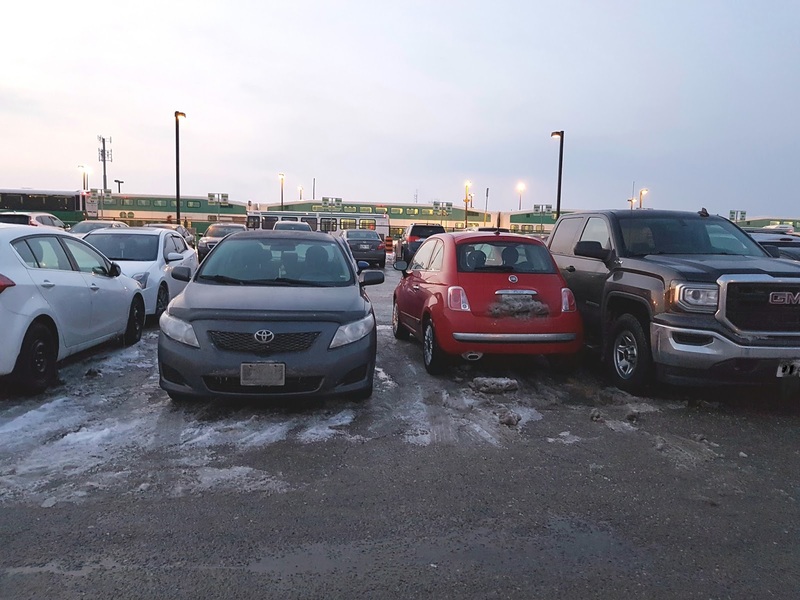 A slow leisurely drive around any GO train lot this winter demonstrates just how bad this epidemic is. It only takes one driver to start a mess. But what puzzles me, and seems to infuriate others, is when other drivers clearly take advantage of the fact that one donkey has parked like an idiot and they, too, park a half car width away from another car. 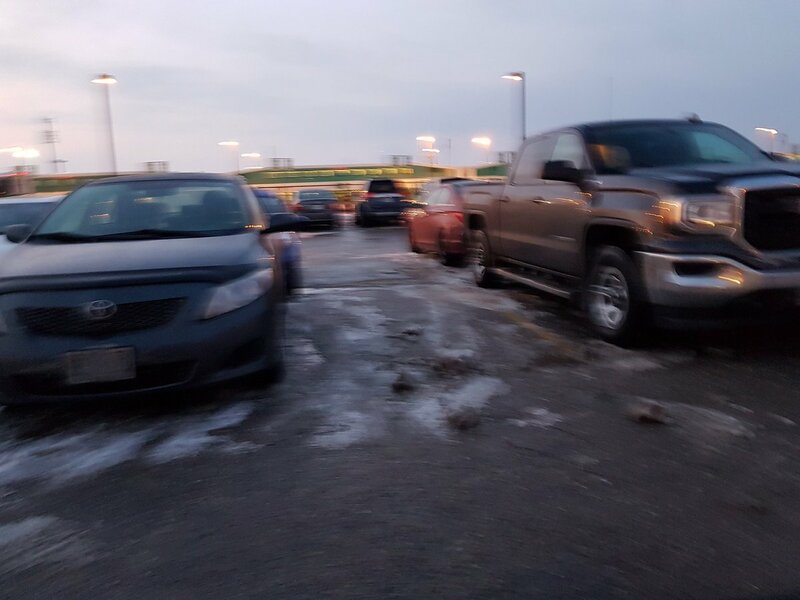 So, now you have an entire row where 80 cars fit on a good clear day that is down to 60 cars, leaving 20 drivers circling the lot, steaming mad, and parking on snow banks and in emergency access routes. And then you have me. In my Fiat. A Fiat 500 Pop to be specific. The width of my Fiat is 5 feet 3 inches. I'm a metric kid but I'm choosing to go with a universal measure so everyone understands. My car is as wide as I am tall. Compared to a Ford Edge, which is 6 feet 3 inches wide, I've got a foot less to work with, which makes parking my car easier when other drivers have behaved badly. That's pretty much the only benefit to a micro car. It's a sled with air bags, capable of highway speeds, that may or may not leave you in a wheelchair after a crash. I'm quoting my mother in law, here. My car terrifies her. WILL ... IT ... FIT? Oh yea, I'm real disappointed with the before photo. I had to snap it quickly because Oshawa GO Station is a raceway in the morning. I held up two drivers when I stopped to take the photo, so I apologize for the camera shake. The car to the right is a full-size GMC pick-up. The left is a mid-size Toyota sedan. Because the blog is read by a different group of people than Twitter (the two media channels are widely separate) I'll share the after photo here and then post it to Twitter on the train ride home. So, what do you think? Will it fit? My Fiat Sled is also a GO car. But I'd still be upset if a window got smashed. My GO car is a 2009 Pontiac Wave. I can park it in a bathroom stall if that was allowed. Plus there would be room to get out. My poor little car is full of door dents, scratches from who knows what and a slightly bent right side mirror but I've never ever failed to get a space. Haven't measured the width but I can squeeze into spaces just like the Fiat. That little car took me and my daughter to Victoria BC and back fully packed with her belongings in order for her to go to university there. A few dings and scratches will not stop the Red Terror. If it can scale and cross the Continental Divide twice at 70 MPH then a few parking donkeys will barely bother it. In case you're wondering, I left the car there for her and flew back. Then I flew back to BC two years later and we drove back to Ontario. Both times through the USA rather than the arduous and much slower trip through the Prairies. The late Lou Brown of Brown's menswear says it best "Because it fits!" Driver can pull up. That's what I do when my passenger can't get in. I didn't see that coming! My money was on "it won't fit". Well done! The rule for WILL IT FIT? is the car can't obstruct drivers exiting. Passengers can deal. I'm REALLLLLLY close to the truck. I'm sure the driver will be unimpressed but this honey badger don't care. Nice car, CJ, and great parking! Mine isn't quite as small bit it's tiny. Still not sure why people think it makes sense to drive an extended cab pickup truck to the GO Station... it's a work vehicle so why are you taking a train to work!? When I complained on this site before someone said that they use the truck for farm work on the weekend. Well, maybe I like camping in a motor home but I'm not going to try to park it at the GO station every day! You are most resourceful, intuitive, and creative my friend. and aren't you lucky to be able to avoid a GO car and a weekend camper??? Many of us can barely avoid the one that does double duty...but HEY we can still park better than lots of douches in small cares - it's not just the size, it's caring. The car pays for itself! Let's be serious: you drive a truck because you think it makes you look cool, not because you need it. And the fact that it inconveniences everyone around you is no concern of yours, of course. No different than the foot riders on the train. We have 2 cars. A really big Ford Flex that is built like a hearse. I rarely drove it to the GO station - it was our only car - and my husband drives to work. And when I did, I found it awkward to park and difficult to find spaces where I could open the door. The Fiat is a sled. It fits anywhere which is why, although I could have easily afforded bigger, I was like, no thanks, and bought a 2013 Fiat at a great price. Hey, it's not for everyone but it beats the bus for me (which I did for 6 long years).